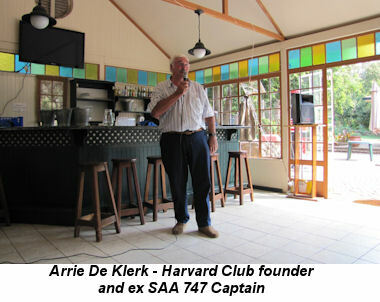 In 1962, 74 of us started training as pilots in the SAAF at Central Flying School Dunnottar - 60 qualified for SAAF Wings. 38 joined Short Service and the Permanent Force. 22 joined SAA or involved themselves in aviation careers outside the SAAF. Only 38 of the original group are still tottering about with 8 of us still flying actively. 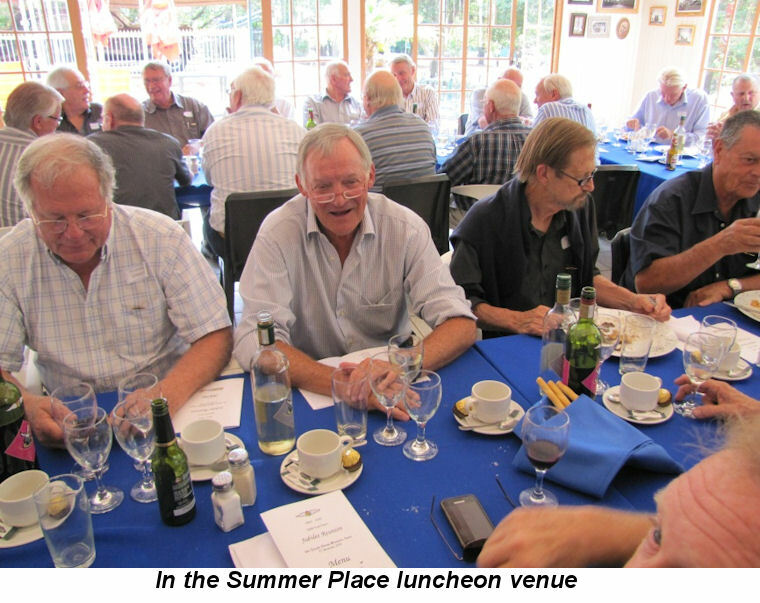 We considered various venues for the Golden Jubilee Reunion, amongst others, a military establishment at Walmansthal, a private game lodge, the SAAF College, Zwartkops SAAF Museum and various Country Clubs before settling on the appropriate Smuts House Museum which has excellent catering facilities for this happy event. 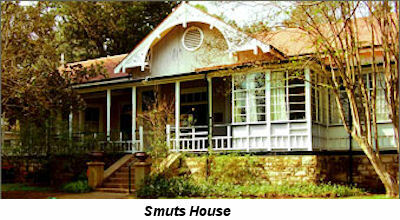 Jan Smuts was a prominent South African and British Commonwealth statesman, military leader and philosopher. In addition to holding various cabinet posts, he served as Prime Minister of the then Union of South Africa from 1919 until 1924 and from 1939 until 1948. He served in the First World War and as a British Field Marshal in the Second World War. He led commandos in the Second Anglo Boer War for the then Transvaal. During the First World War, he led the armies of South Africa against Germany, capturing German South-West Africa and commanding the British Army in East Africa. From 1917 to 1919, he was also one the members of the British War Cabinet, who created the Royal Air Force. He was the only person to sign the peace treaties ending both the First and Second World Wars. One of his greatest international accomplishments was the establishment of the League of Nations, the exact design and implementation of which relied upon Gen Smuts. He later urged the formation of a new international organisation for peace: the UN. Gen Smuts wrote the preamble to the United Nations Charter, and was the only person to sign the charters of both the League of Nations and the UN. In August 1912 the Commandant-General of the Citizen Force, Brig Gen C.F.Beyers, was sent to England and Europe by General Smuts to observe and report on the use of aircraft in military operations. Brig Gen Beyers was so impressed by what he saw, that when he returned home, he strongly recommended setting up a school of aviation. This was to be the Paterson School of Aviation near Kimberley which resulted in the formation of the SA Air Corps. The SAAC formed in January 1915 and was used in SWA and German East Africa. Col. Pierre van Ryneveld was appointed Director Air Services with effect from 1 February 1920 with instructions to establish an air force for the Union. This date is acknowledged as marking the official birth of the SAAF. 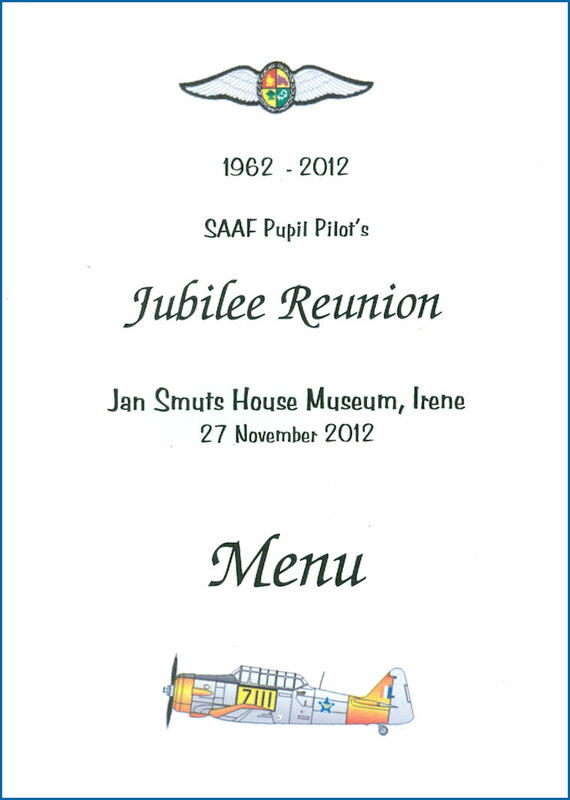 Our menu was modelled on Gen Smuts’ favourite dishes with specially labelled wines. 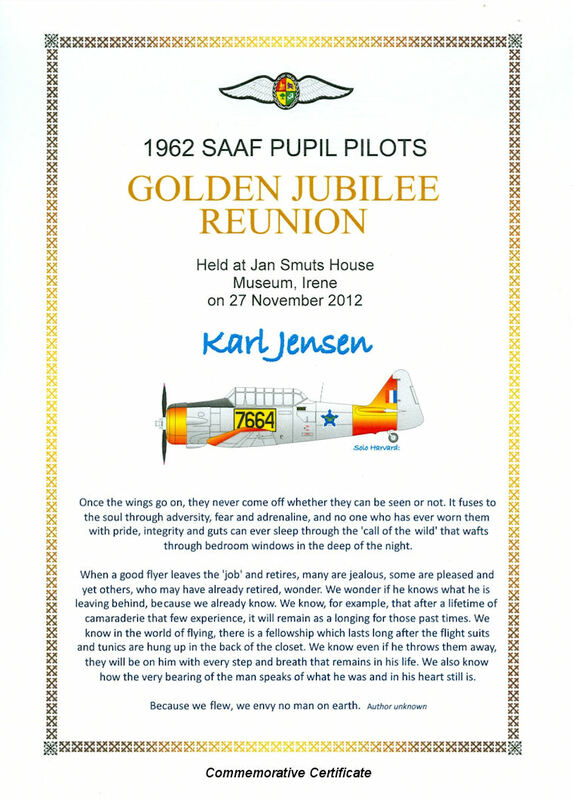 Each of the 32 attending, received a gold framed commemorative certificate personalised with the particular Harvard in which he flew his first solo, a pair of specially designed gold miniature wings badges and a copy of a DVD containing scenes from our flying training era. The majority contributed short histories of their lives and diverse careers since ’62 which were combined into a booklet that was available to everyone. With a PA system, all the members had the opportunity to regale us with whatever tales they felt significant. Of course there was a lot of laughter as well as a sombre moment when we remembered the 26 of our fellow pupil pilots who have passed on to the big cockpit in the sky. 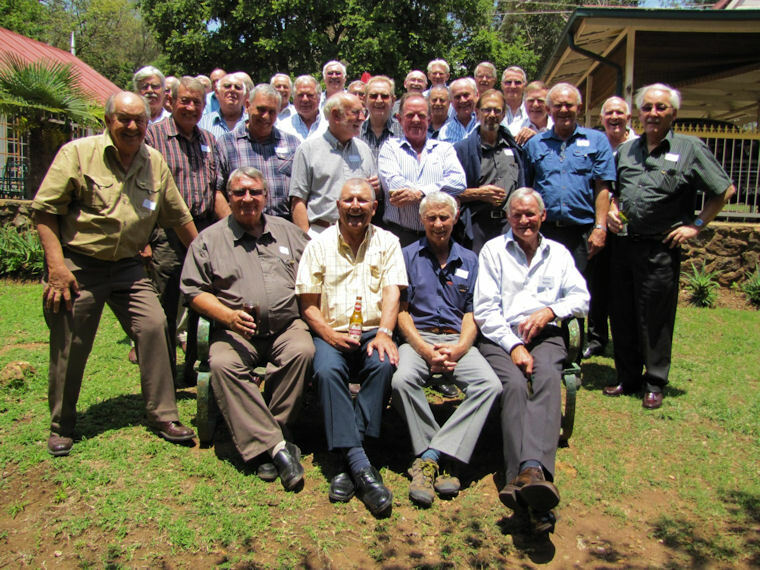 We have decided to hold our next reunion with improved wheel chair access in 2022 when we are nearing 80. 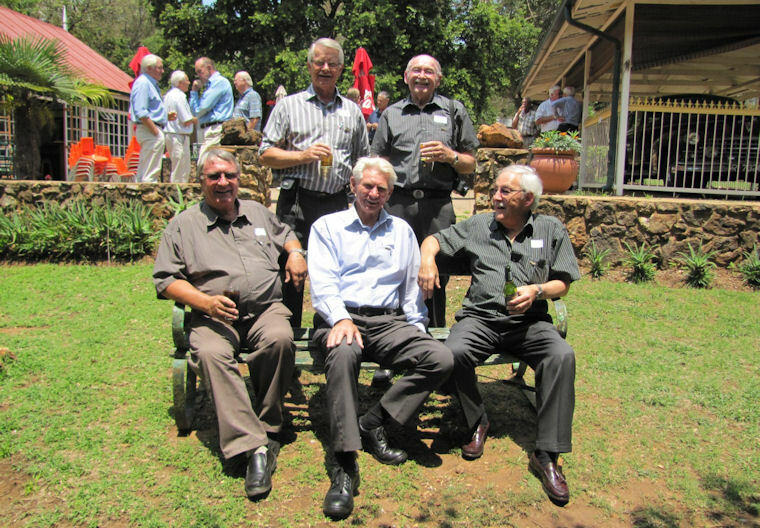 Standing: Wim De Beer retired Civil Engineer, Gerhard Beukes PhD, lecturer in mineralogy. 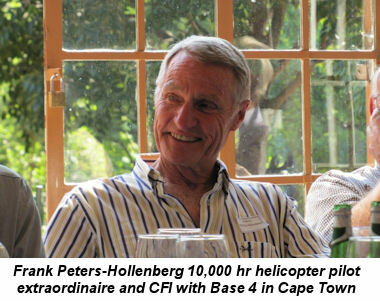 Seated: Jan Kasselman BCom, flying school owner and Chief Pilot Grijo Ambualnce Services Klerksdorp, Alex Cousins Civil Engineer and owner of “Yachtmaster Sailing School - Cape Town” & J.J. Brits, Neuro Surgeon who advises avi-itis is like aids: it will not necessarily kill you, is incurable, goes into remission for long periods, but will recur and make you poor!